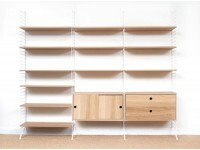 among the 194 entries submitted from around the world, string is crowned winner of bonnier's bookshelf competition. in the same year string is founded. 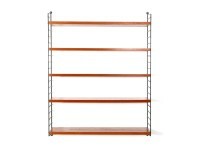 string shelves are ordered for the offices in the newly built UN building in NYC. 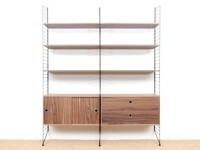 string releases the standalone string shelf. Nils never likes it. string is awarded the gold medal at the Triennale in Milan. string exhibits at H55 in Helsingborg – the start of “Swedish Design”. Deutsche String GmbH is founded. In Colombia, string is paid for shelf deliveries in emeralds. The floor panel is launched. string takes a number of plagiarists to court. The Supreme Court rules in string’s favor and the shelf is patented. A new storage concept Tingoteket is launched but it never becomes a hit. The string shelf is incorporated into the Swedish National Museum's design collection. 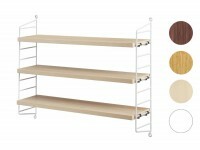 The bookshelf Kam by Nils Strinning is awarded “Excellent Swedish Design” by Svensk Form (Swedish Society of Crafts and Design). 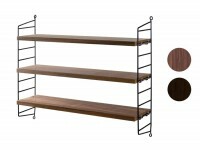 Nils Strinning is awarded the "Classic Prize" and string’s computer shelf gets the “Excellent Swedish Design” award. Both prizes are awarded by Svensk Form. 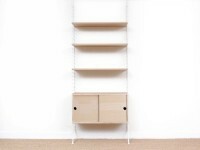 An all-white string shelf is exhibited at H05 – 50 years after H55. Walnut, oak and solid black are launched the same year. string pocket is unveiled at Form/Design Center in Malmö. 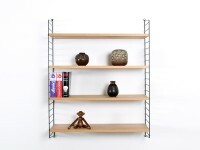 The string shelf is classified as a work of applied art under copyright law. Artek celebrates 75 years - string is commissioned to produce a commemorative pocket in "Artek-gray". string turns 60 and celebrates by letting Mats Theselius style a limited edition string pocket. The result is 600 numbered string pocket shelves in gold / rosewood. Rebecka Tarschys’ book on string’s history "String Pocket" is published. The collaboration with Björn Dahlström and Anna von Schewen results in a folding table. string continues to work with Anna & Björn and the office range string works is presented for the first time.